She underlined the role of the social economy in employment creation: 10% of the 23 million enterprises in EU are social, accounting for 11 million workers. In the economic analysis of most European conservative parties, brutal public spending cuts are an important factor sluggish growth, so the job creation potential of social economy actors provides the hope of palliating some of this social vandalism. Ms Auconie evoked a plan to create a “passport” helping private investment in the ‘solidarity economy’. Currently enterprises depend on public funding, which, she said, puts them in a precarious position – which goes against the view that the state is a reliable and trustworthy stakeholder in social policy issues. Ms Auconie put forward the view that private investment would be able to secure a more stable future for social enterprises. She supported the use of a social entrepreneurship label to raise awareness amongst potential investors, and called for a communication campaign to be linked to this. The fund for social enterprise is supposed to be flexible, and will be reviewed in 4-5 years in order to see how it has performed. Voices in the room encouraged the commission to ensure that the fund could take account of the eventuality of private investors pulling out of the enterprises they are funding. Ms Auconie recognised this and agreed that it is important to ensure that the rules protect enterprises, while allowing investors the freedom to place their money where they choose. Heinz Becker MEP (AT, PPE) emphasised that social enterprise requires that the capital invested in the enterprise should not be linked to the decision making within the enterprise and that remuneration of capital may not be a driving part of the business model. He said that it would be important to place youth entrepreneurship at the forefront of concerns, to help combat the chronic, mass youth unemployment across most EU member states which is threatening dire long term consequences for the society as a whole. A speaker from the NGO Confrontations supported the proactive approach from the Commission, since in the past it has tended to take a more reactive ‘sticking-plaster’ approach. Other voices from the floor argued that there should be a limit in place on remuneration of capital to ensure that the social component stays firmly in place and is not watered down in the direction of simple for-profit business. Jens Nilsson MEP (SE, S&D) of Regional Development Committee said that his committee is currently working on rules for cohesion policy. Many consider that the social economy has great potential for boosting economic growth in their regions. On the 14th May a seminar will be organised by Mr Nilsson on the role in the regional partnership which is being created for cohesion funds. Satu Tietari, Member of the Committee of the Regions and rapporteur on the responsible business package made the point that enterprises need a better flow of information, especially for SMEs. She said that her report supports the use of online tools, such as a database of existing social entrepreneurs, and the labelling systems in place in different countries. She encouraged thinking about whether new legal frameworks were needed, emphasising the view that it should be profitable to act in a responsible way. Public procurement should be taking better account of the environmental and social impact. On the other hand, the procurement processes must remain uncomplicated to the extent that it is possible. She also called attention to the need for an increased role for training and education, and talking about entrepreneurship in school. 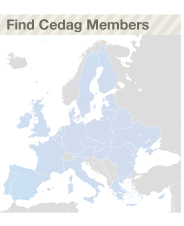 These debates are still ongoing – if you would like to make your reactions known to the CEDAG membership, please contact the secretariat.